Small, sumptuous cards are the go-to for wedding invitations, but it can be tricky to squeeze in all the details that go into a busy wedding weekend. For couples who want more space to share their story, or extra details about the venue and ceremony, newspapers are a fun and unique alternative. Hong Kong-raised designer and calligrapher Chavelli Tsui has done it all when it comes to wedding stationery: from miniature save-the-date scrolls to intricate, hand-drawn maps. To set a playful but sophisticated tone for Julie Qiu and Brian Achtyl's coastal wedding, she chose a digital tabloid newspaper – and fell in love with the format. She shares her experience designing a wedding newspaper below. 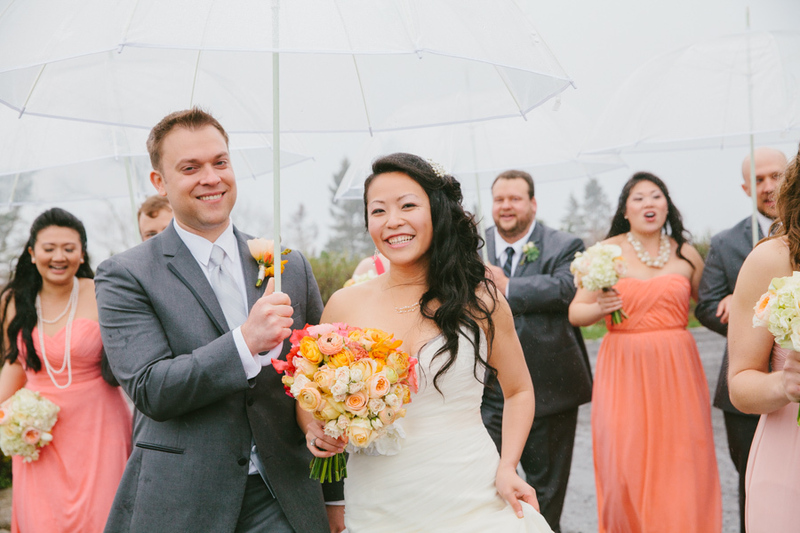 NYC-based Julie and Bryan got married in Maine, at a gorgeous venue – French’s Point. 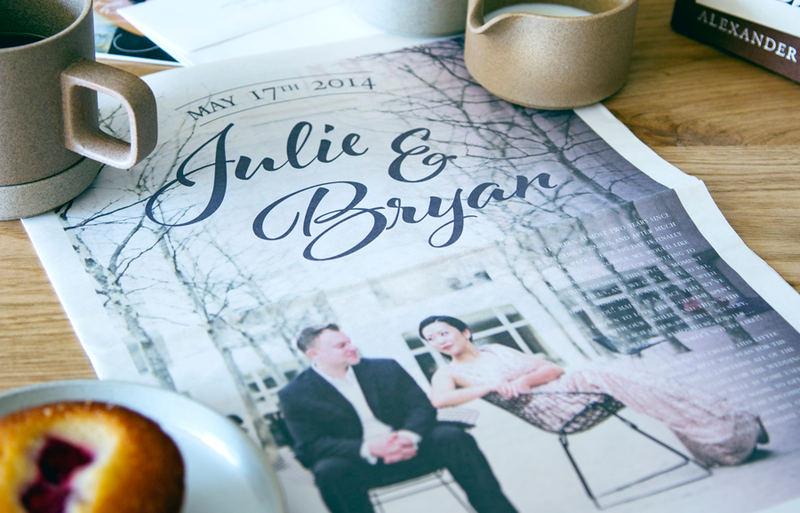 Since it was a destination wedding, Julie wanted to send an invitation packet that would be chock-full of information: from wedding details to driving directions and even restaurant recommendations for the area. We decided that a completely unique way to do this would be to send a wedding invitation in the format of a newspaper. As the designer I really relished the challenge. I’ve done a lot of magazine and journal layout design before, and to do it with unique content for a wedding…well, I knew it would be a ton of fun. One of the amazing things about this format is that we didn’t have to be too picky—we used at least 10 different photos of Julie and Bryan over the years, as well as incredible shots from their engagement shoot in New York City. We could afford to give more detailed information too since the newspaper offered far more space than a few small cards. In the end, the newspaper featured a whole spread with details of the wedding weekend (the actual “invitation” itself!) with gorgeous images of the venue and couple, a page on accommodation, a page on how to get there (with a map of course!) and a fantastic double spread of food recommendations! Even though it wasn’t necessary to maintain the expectations of a “newspaper” layout, we had fun with it! The back page featured a crossword puzzle of facts about the bride and groom, along with an awesome panda comic drawn by Julie! Guests absolutely loved the newspaper invitation and several brought it with them to the wedding trip because of all the destination guidance. Many actually kept them long after the wedding as a keepsake, which was particularly touching for Julie. If that isn't one of the main goals of a wedding, I don't know what is! See more photographs from Julie and Bryan's wedding at Style Me Pretty and keep up with Chavelli Tsui's work on Instagram.